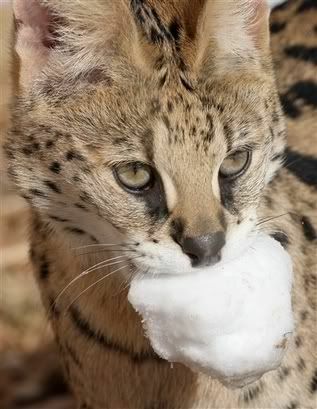 Jambo, a Serval, carries a snowball in his mouth as he plays in the snow at the Cincinnati Zoo Thursday Jan. 3, 2008, in Cincinnati, Ohio. Servals, in their native range of central Africa, would not see snow in the wild, but Jambo as part of the Cat Ambassador program at the Zoo. That's making my teeth cold!